The high-performance Virtual Servers powered by enterprise-class hardware with reliable and fast SSD Storage. The record performance of our SSD VPS deployed on Intel NVMe SSD drives. 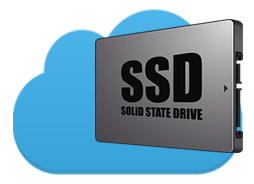 Our SSD VPS storage systems use only the most reliable and fastest SSD drives from Intel with NVMe interface. Your SSD Virtual Server protected against DDoS not after the attack, but around the clock and stably withstand up to 150 Gbit/s. All disks, including SSDs, are integrated into RAID6 or RAID10 and are under constant monitoring, which excludes any possibility of data loss. All our hardware nodes are connected to dedicated channels at a speed of 3 Gbit/s, and the density of VPS servers for clients allows us provide bandwidth up to 300 Mbit/s. Traffic unlimited. Popular Control Panels like cPanel. More than 200 Apps, CMS and scripts.